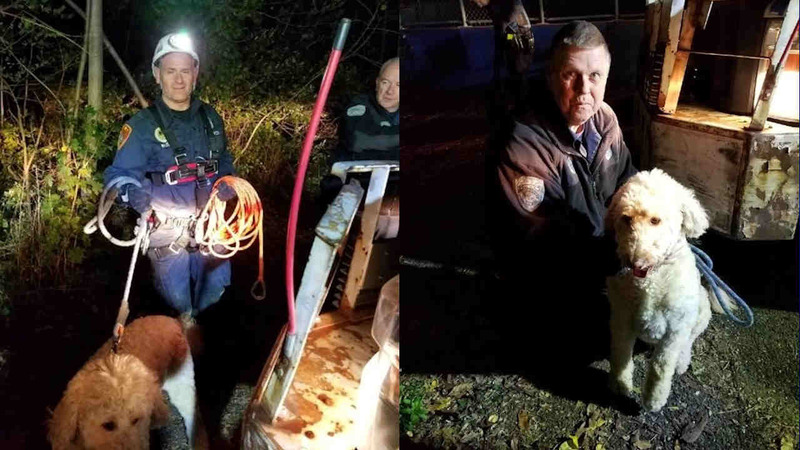 KINGS PARK, Long Island (WABC) -- A dog was rescued Tuesday night from an abandoned cesspool on Long Island. Around 7:30 p.m., Boris Avezov was outside of the Superior Ice Rink on Indian Head Road in Kings Park with his dog, Poofa. According to the Suffolk County Police Department, the 6-year-old Golden Doodle pulled his leash away from his owner to chase a rabbit. Poofa then fell into a 16-foot abandoned cesspool behind the ice skating rink. It took about an hour to rescue him. Suffolk police were lowered into the cesspool using a mechanical pulley, then used a sked, a piece of equipment normally used to rescue people, to save the dog. Poofa and the officers were unharmed. Avezov, of Bellmore, had been waiting for his children who were ice skating at the rink.